Having shot your guinea fowl............or bought it from Woolworth s or wherever, you may wonder how to make a successful meal out of it. 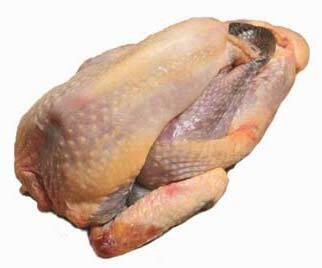 Oh, and by the way, having eaten many wild guinea fowl, there is no doubt that the farm raised guinea fowl are far more succulent than wild. Theyalso still have that unique "Guinea Fowly" flavour, but less marked. The meat is a bit lighter and generally the bird is fatter. Wild guinea fowl have a much stronger gamey taste and can be sinewy and tough unless they are shot in their first year. An older bird is nice, but forget about doing much with it other than creating some sort of stew. That can be very nice too though. A large bird or two small. 5 segments of garlic crushed in their shells. 2 clove pieces, or a good pinch of ground cloves. Half a cup of dried tomato, roughly chopped. Teaspoon Coarse ground black pepper. 1 or two fresh green chillies or to taste. 2 medium carrots quartered lengthwise. With a cleaver or heavy knife, cut the bird into 4 pieces. Two leg and thigh with a bit of back, and two breast halves and wing. Thoroughly shake up the pieces in a mixture of the lemon juice, wine, lemon zest, garlic and chillies. Let it sit for an hour or so, and re-mix it from time to time. Now roll the pieces in flour and shake off. This is my pet method of retaining flavour. Put a good slosh of olive oil into a heavy bottom pan and brown the pieces slightly, turning them as few times as possible. Put the browned pieces into a large pot along with the other ingredients and the remains of the lemon juice and wine and add a cup of water. Arrange the carrots and red onion quarters around the pieces. Put a lid on and simmer for an hour. The long cooking time is necessary to get the meat tender enough to come off the bone. DO NOT stir or interfere during the cooking. We want to end up with 4 pieces in a thickened sauce. You may need to add water or simmer a little longer to accomplish this. This is fantastic served on basmati rice or with mashed potatoes. ha ha make sure you get a bird licence!Then invite me to help eat them. what about your recipe?